A car dealer approached us recently asking for help designing an image to commemorate its 100th anniversary next year. This dealer had started selling cars out of the local general store in 1911 and has been at it ever since. That’s a long time! What they’d hoped for was an image that would convey three character attributes of their company — integrity, resilience and commitment. These are wonderful qualities. Problem is, any one of them is almost impossible to convey in a graphic (quick! what does resilience look like? ), not to mention all three. Not only that, but they’re inward-facing; that is, they have meaning not to the customer but only to the company. My recommendation: Turn and face the customer. One hundred years in business, all by itself, speaks plenty about values and vision. The company has stood the test of time and all that that implies — and the customer will get it. It’s a Model T wheel and a modern car wheel, a compact image that spans a century of automobiles. Use it as a badge and stick it on everything all year — Web site, stationery, print advertising, signs, posters, invoices, all of it, wherever the company name or logo also appears. It of course needs refinement, and whether they use the image or not remains to be seen, but I pass along the idea because I’m sure there are many old-new topics that can be depicted in a similar way. This entry was posted in Branding, Design, Logo design. Bookmark the permalink. That just flashed through my mind. I wasn’t sure about your 100 years logo on its own, but seeing it in-situ, as on the car lot banners, it seems ideal, especially with the red header component to give it an anchor point. This sparks the thought in me that, as a designer, it might be prudent to try out designs virtually to get an idea of how they will look before getting them produced. I guess this is why I have found in my business that it has become commonplace for clients to request that I produce virtual trade show booths with required graphics prior to construction (or, lately, retail outlets with mock products and signage). It “sells” the idea easily, as yours did me. It also sparked in me the thought of how, as a designer, it is imperative to become a proficient 3D modeler or, at least, a proficient photo editor. I like it. The idea is great. I would, however simplify the wheels: try to draw them with vectors, just outlines, or something like that. I am not sure myself if it would work. I would give it a try, though, and play with the different wheel forms. Make the outlines as stripped down as possible. This way you will have, at the end, something that might work with one color and can be even engraved on surfaces and more widely used. They used a similar idea to yours. I love the idea, but I’m not keen on the different types of wheels — although there is history underpinning the concept, the red in the older wheel puts emphasis on that wheel. Is that intentional? I agree that clients try to fit a manifesto into an inkblot yet think there should be room for the client company’s personality to come out more — even at the expense of the design aesthetic. This solution is slick, but generic to the car trade. It could have been bought from a wholesaler, like a “Summer Sale!” banner, or might have been supplied by a brand like Ford. I’d like to know whose centenary it was without standing on their lot. I know it’s a work in progress, so I’ll look forward to seeing the final version — I’m sure it will be great. I like it . . . clever, creative, simple, yet says it all. Attracts attention and gets the message across quickly. You don’t stay in business for a hundred years without — integrity, resilience and commitment. Perhaps the “1” could have been a little thinner, but to be seen from a distance it needs to be bold. Will look good in any size. Oops, forgot to mention . . . the tire used 100 years ago and tire of today is a great idea . . . Stunning but it doesn’t speak the 100 years this company has gone through strongly enough. Although this can go from person to person and designer to designer, I just think a 100 years really is something to celebrate and that it should show! I would have gone with re-designing one of the first cars sold and really would have pimped it out and made something really eye-catching and a little more informal. Don’t picture a rock-star look, but a really cool car design that came out of 1911 but pimped up to fit today . . . ! The one thing about the font that throws me off is the bold 1. The wheels have a thin tire, and the bold 1 overpowers them. Having a thinner 1 would tie the rest of the logo together. I really like the concept. As a designer, I’m in awe of companies that have maintained their integrity over decades and how we (sometimes) get the opportunity to visualize that message. I hope you were able to dive into their photo library — creating a 100-year celebration magazine. YES YES NO . . . how many clients have we met that have too many mixed or “inward” messages? This is a great example of how to “educate” your client a little. The design as a concept and “message” is perfect! Designers are not always simple . . . but love simplicity. Leave off the “years.” While Gotham is an awesome font, maybe a humanist typeface . . . such as Gill Sans . . . the 1 is pretty much a slab . . . I think it’s perfect . . . especially when you’re driving by the dealership . . . instant recognition. I like the concept. It’s just a little too static. What about turning the “years” into a road, perhaps with a gentle swoosh to it, as if the 100 is heading down the road to the future. Good idea, but then the zeros in 100 are crying out for the wheels idea. Might have been more difficult with the 75th or the 125th anniversary . . . The old wheel just doesn’t look that much like a car wheel to me — even though I take your word for it that it is a Model T wheel. The biggest problem, though, is that I am getting a mixed message because of the color of the typeface. Somehow it swallows the new wheel and yet tells me the old wheel is something different from the font and the new wheel. I don’t think that is what is intended. Perhaps a grey for the font would tell me that the two wheels are together and that they represent the span of the company — that’s what I am thinking. I love it! Great use of the wheels to depict historical evolution. And I actually think the font is really strong and solid — something you want from an auto maker. Resilience can take on the shape of a lot of things. I thought of wrought iron. Tony said carbon fiber, but it could be steel, too. Look at construction over the last 200 years and you’ll find plenty examples of “resilience” in material goods. I suggest you keep the font but texture the numbers instead of replacing them with wheels. Few people will catch on that you used a Model T wheel. Go with grills instead . . . hey have changed more dramatically over the years and will work well as a texture. I like it. Conveys the idea succinctly. Adding anything would really detract . . . however, adding things is what everyone seems to do these days when it comes to design. I agree with Igor. The idea is good, but it looks more a book cover — “One Hundred Years of Car Design.” Doesn’t make me feel like a celebration of 100 years. I would work more on the idea of a celebration. What is the dealership’s name? Can you use their name as part of the 100 Years image? 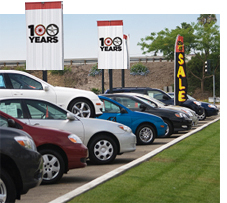 Or can you use part of the 100 Years image with the dealership name? I like the idea, but as you stated, it does need to be refined. My company is over 125 years old. While exploring a new identity/logo, we found that customers couldn’t care less. They are focused on what we can do for them now and in the future. I think using the word “century” would give the logo some class, and it will be used for one complete year anyway. A concise image to convey a long time span. Well thought out and brilliant! I love the concept, and it’s clean and attractive . . . but on its own it seems disconnected and too brief. Sure, use it as the element that crosses media, but I would always pair it with something else: the dealer name on the outside of an envelope; the special event (0% financing on trucks!) on the lot banners. It’s like a logo — small and succinct for company identity for a year or two, but not the main message itself. 100th anniversary? I think balloons and cake, summer picnics with wicker baskets, traditions which surpass time and connect us to the past. It certainly has impact but the wheel idea seems too busy, overpowers the message and does not communicate the concept well. I think 100 YEARS is plenty strong . . . and the visual should be subordinate to the copy, in this case. You are so creative! Can the numeral “1” be represented by an image? You inspire me. I turn to your designs so many times as a starting point to let my imagination soar. Thank you! Using the model “T” 6 modern tires for the 0’s in the “ad” was a brilliant design! Kudos! I’d go the same route, just, the font you use (Arial black? Futura?) just doesn’t cut it for my taste. I’d go with something “bold” like that (Futura or better “Impact”) and “design” around it, giving it a “tuning-like” look (all pun intended). I’d love to submit an idea, but I rather not “mess” with the “creative process”. . . let’s see where does this takes us . . . In the meantime, I’d go design some . . .
*Edit, plus, I just saw the tiny lettering that reads “Gotham Ultra” . . . But again, this is not the font I’d use . . . Turn it around. What are the benefits of the attributes the client wants to speak to? Expand the graphic with a tag line. The graphic says 100 years. Let the copy speak to the benefits. Maybe a little long, but typographically you could make it interesting. Like a badge or a seal or a stamp. Good luck. You can figure it out. I think Gotham Ultra works well. Have you tried changing the color of “YEARS” to match the red in the wheel? It would also be nice if the old wheel had a black tire. I think it would stand out a little better on the white background. I like the concept, though. Being a (modern) car buff, I feel, besides the color of the car, that the wheels are the next most-recognized part of a car. So for you to bridge the 100-year span with the look of the wheel and how it’s changed is brilliant. One thing, though, that isn’t quite right. I think the Model T wheel should be black or dark green with a black tire. The first Fords, after all, were painted black, if my memory serves me right. Wow, I totally love this idea. Simple and meaningful. Also the all-year recommendation. Thanks for sharing. I like the concept as well but also feel the font is too overpowering. I also want something more. Not sure what, exactly, but it doesn’t feel “designed” — it feels like a good concept was put together quickly to get it out. Also, what are they committed to? Quality? Customer Service? Making money? Each of those have graphical visuals. There might be more questions to ask the company to refine the goal. Ah, Gotham . . . the new Helvetica. Since the message is meant to convey the history and resilience of the company, try going with a serif font (Avenir, Century, etc.) and maybe something in blue, which people tend to interpret as a color of safety and stability (i.e., resilience). I’m not a fan of the wheels, though. I agree with Igor — the font is a bit too design-ish. With a face that simple, it will have to be paired with other design elements, whereas using a font with a bit more character will let the graphic stand alone, and support the cool idea conveyed by the two wheels. There would be a bit more positive energy if the “wheels” were not running over the 100 (years). The wheels could be running over a bit of ground and carrying the “Years.” The font combined with the red bar on the banner gives me a first, strong impression of Rome or a battle field feeling — not so sure that conveys a nice or happy feeling about the automobile. I think the old and new wheel is good, but I am a car person — I even owned a Model C fire truck. People today hardly know what end of the key to put in the ignition, let alone what the technology of their car looks like. I would suggest you put a rear fender (Model T) over the rear wheel with a rear bumper, and a modern front fender and bumper over the front wheel — all in the simplest elements, of course. I think the font is good. It gives the tires a “platform” on which to rest. Any font that’s less strong or thick wouldn’t do the job. The concept is sound to me but lacks movement. The wheels really look good, but I would try to overlap the old with new to create a movement of age to age, then thin the “1”. Give it a try — hopefully, that may add depth. I would try a replacement, using a mix of old and new typefaces instead of the wheels. I love the use of the tires, but agree the “color” needs to be more even, e.g., the “1” needs to be more in tune with the weight of the two tire zeros. This would work as a great tagline, included with a modernized version of the client’s original logo. I have designed centennial logos, and I use a tagline as the added “hook.” Currently in the process of an additional 100-year logo, my current client is resistant to changing their original logo, but loves the idea of speaking about 100 years of service. I love it — I think some comments have forgotten that the key to design in the end is to get the consumer’s attention in two to three seconds flat. If the words are too flashy or things are too subtle it will get lost, and people won’t see what is intended. I love subtle and beautiful design. However, if it doesn’t grab the people with the $$ and get them into the lot — then it failed. The red bar grabs attention first. The 100 gets the point across, but only when you’ve read “years.” The guy that says you don’t need “years” is incorrect, because when you have a lot filled with cars and a sign that says “100” only — what does that mean? 100 cars? 100%? 100 customers? The word “years” is required; it reinforces the tires above it. The 100 years in business proves in and of itself that the business is solid and trustworthy. Any more than what’s shown and it just distracts away from the point. Two seconds, folks — that’s what it comes down to . . . two seconds. If you haven’t grabbed them by then — it’s money wasted. Great concept, but agree that the “1” is very heavy, and the red wheel rather stops your eye and doesn’t allow the modern wheel to pull your attention to the current. While readability from a distance demands some boldness, do the images of the two wheels convey their messages at the same distance, or do you have to get closer to receive the message? The Gotham definitely overwhelms the more delicate wheels, to my taste. Perhaps a 40% screen, or something eyedroppered from the wheels. Something more complex, but much more readily understood, might be a head-and-shoulders 1910 driver with his goggles and hat beside a modern person (the goggles, etc., have already established the “driver” message). Put “1910” and “2010” under the respective images with “to” in between, and you’ve almost said it all. Images could be an engraving on the left, photo on the left, to really hammer home the message. The inward-facing comment really struck home as I look at the 175th anniversary logo my client finally approved (mclanahan.com). We couldn’t get them to budge on the character attributes, so the logo became a study of how to incorporate too many messages into a cohesive whole. You can’t win them all, and since my client loves the logo I consider the project a success. The logo has been used extensively in many ways over the past year. It was a good reminder that a logo can end up almost anywhere, so keeping in mind how a design will translate to various media is critical. The concept is appropriate, but I agree with many of the comments regarding the font. The “1” is jarring. I would make the two wheels more alike in color palette, but keep the red. Offering a realistic photo mockup of the logo in action is brilliant. I liked the logo much better after seeing it in “real” life; I’m sure the client will too. Curiously, I like the simulated banner — its ratios of print to space and position and the red color — I find it simple and attractive — that said, I really don’t really like the logo as shown above; I find the wheels litter, maybe too cutesy. The “1,” as others have said, is somewhat awkward and not fitting. Haven’t had a chance to read through all the comments yet. I liked the logo, but when I saw it on the banner mock-up, the current wheel/zero reminded me of the star logo for Chrysler/Dodge. This would be good if this is such a dealership. Bad if it’s a Ford dealership or other. Your cobbled together rough draft is pretty darn good. Put onto those background banners in the lot looks great, as does the red stripe at the top of the banner capping the image. Keeps the image in view. Darn near perfect if you ask me. A slightly more modern rim maybe. But beyond that, it just works. Solid. That’s design at its best. Just read through all the comments. If you futz with things too much you will kill the idea. What was presented is actually quite good and solid and not to design-ish. The design is absolutely good. One can’t do it better. I am glad that there are still people who know how to use type and image in perfect combination. It reminds me of Lou Dorfsman, the fabulous designer of CBS. My advice would be to ignore all advice. I like the 2° tilt of the red spokes, which is subtle enough to prevent the design from being too static. If not, perhaps the second wheel should also turn a little. Bravo ! I am not clear on the concept at all here, at least with the idea of hanging banners in the parking lot, as pictured here, and the original words “100 Years.” If I were driving by the store and caught a quick glimpse, my first reaction would not be, Wow they’ve been in business a long time! It would be more like, Did that say “100 Years”? (not easy to read from a distance) 100 years of what? Or did I read it wrong, and 100 was a price for something? Usually the banners in a car sale lot scream out “Prices Slashed” or “0% Interest,” and frankly this logo sort of screams out at you, too. A 100-year anniversary is a time for nostalgia, for old sepia photos, for big initial caps in old-fashioned fonts. And the audience for this is not the person driving by the store, who probably doesn’t really care how long you have been in business, but for existing customers. So large, blown-up photos in the sales room or a special calendar handout would make more sense than developing any logo at all. Why was it decided that a “logo” was needed at all here? Robert, can you give us some background on that decision process? It seems the issue here is not whether the font you used could be improved but why you assumed the client needed a logo in the first place. “Can you make the wheel spin, and the black blacker, and oh — can you use different . . .” All those years of school and experience seem to matter in getting the RFP but not in doing that voodoo that we all do so well. I liked the rough and feel like the client should have done their own if they had a better idea. What about including some element that makes it specifically their 100 years? I think of putting the car onto the wheels you saw in the 100. Less prominent, to be sure, but for a print ad, for instance, without the context of the on-site display, this says 100 years of cars more specifically. Ideally, the envelope will help pull the eye into the frame as well. The “morphed” Model T-to-futuristic e-car could make this more eye-catching, but certainly the 100 should rapidly emerge as visually dominant. 100 years of what? All it says is 100 years. Not enough to convey the fact that they are a company that has what it takes. Somehow you need to do a better job of letting the customer know that they know cars, and have for a long time. Logo is cute, design appreciative, but not “personal” enough. I could do a better job. I can’t believe I am about to critique John McWade, who I consider to be the greatest designer of all time, but here goes: I don’t like this design. I think the messy wheels strike a discordant note with the strong and solid black type. And I think that “100 Years” doesn’t “say” enough. If I were the customer, I would ask you to return to the drawing board and try again. I know you can do better than this. I like most of what is produced by Before & After, but this design is lacking something, and I am not sure exactly what. I am all for clean and straight to the point! Maybe it is 100 years of what? Cars, tires, wheels? With the shortened attention span of today’s consumer, we only have a nano moment to convey our message before they purge their mind and move on. Clarity is important. As Jim says (above) says, prospective customers couldn’t care less about a century of service. So, although your logo idea is kinda good, my feeling is that’s an inappropriate message. I like it just as it is. It’s sharp and clear, and it cleverly gets the the notion of 100 years of car sales right to the viewer. Well done! I don’t care for it. On the banners, it appears to be a bullseye dot and a Chrysler symbol (perhaps appropriate, but I bet not). And 100 years in itself means nothing. 100 years of what? Are you talking about the dealership or the cars’ manufacturer or the age of the dealer? I think it needs some work. Use not one but several banners with a motif that spreads the message and graphics across several banners — then have the central graphic be a part of widow and showroom displays and literature. Something very attractive, not unlike what is shown in the site above about Graz. Let art that is attractive attract, and forget about making it relate to automotive. Let the liveliness of the art be the reflection of resilience — 100 years speaks to commitment and integrity, and it needs no further help. I like the concept. As an alternative, I was wondering if the company has a logo that can be used as a symbol of integrity and trust. Maybe have the words: Trusted 100 years. Really love this exchange of ideas. I’m a believer that there are lots of great solutions, but that there’s no “one right answer” in design. Thanks, John, for sharing your in-process ideas. And thanks to all the comment-makers, too. I think a lot of people are looking at this as a finished, stand-alone design. And from what I gather, it’s meant to be a design element added to the existing or new material. Like @Bern said, having the image of the man and woman, etc. And then somewhere in there having 100 years. Because what @Pam said is true — 100 years really only works on its own when someone’s reading it on the lot. And as far as what @Aniko said, I believe this is not meant to stand the test of time but last maybe for a year. Some of us remember Mary Wells. I like the wheel idea. I agree with the others that the font needs to be different to work with the wheels. 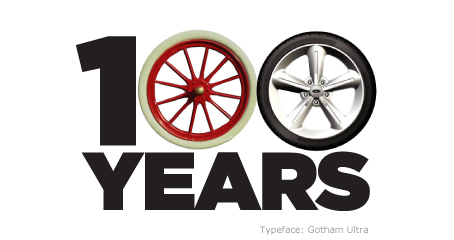 I recommend an “old” antique font to support the longevity and history of the 100 years and support the style of the first wheel at the same time . . . try Rosewood or Playbill font. I work in an in-house corporate design team. We’ve recently been given an anniversary image along similar lines, and have had real difficulty using it in conjunction with the corporate logo. I wondered if you had done any mock-ups that show how this image can be used in the ways that you suggest (i.e., on headed paper, banners, etc.) without overpowering or competing with the corporate logo. Our corporate logo uses a stylized flower, and the 0 in the anniversary uses a photographic flower, so it is both repetitive and jarring! Any suggestions? Or perhaps an article on using multiple logos…? Perfect! I think you hit the idea and communicate the message, and the only way to go deeper is with a paragraph. Maybe a byline if they want to add some explanatory text, but I would say this is a job well executed. Did they use your idea?